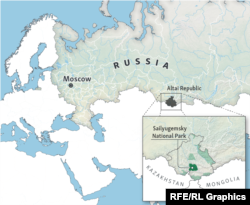 ARGUT, Russia -- Ecologists long suspected the rugged mountains of Sailyugemsky National Park -- tucked into the Central Asian notch where Kazakhstan, Russia, China, and Mongolia meet -- were prime habitat for the beautiful, endangered snow leopard. "Rodney said that if we protect the snow leopard in the Argut area, then their population might recover to sustainable levels within 10 years," Russian naturalist Sergei Spitsyn tells RFE/RL. "Because this is the home of the largest concentration of Siberian mountain goats, which is the snow leopard's preferred prey." "But to our surprise," Spitsyn continues, "over about two years of trying we were not able to photograph a single snow leopard. Only in February 2012 did we find the tracks of two individuals on the left bank of the Argut River. We set up a camera trap and in May we finally got pictures of the two animals, which we named Vita and Kryuk. We understood that we needed people who were intimately familiar with the domain of the snow leopard: hunters." Mergen Markov knew where to put the cameras. In 2013, Spitsyn traveled to the remote settlement of Argut to meet with local hunter Mergen Markov. Life in Argut is severe -- the one road into the settlement is often passable only to the sturdy local horses. The 12 remaining residents try to eke out a living as shepherds. But a lot of them turn to poaching to make ends meet. A snow leopard pelt can bring in more than 40,000 rubles ($620). "He came in and told me his project," Markov recalls. "Told me how it was supposed to work. He gave me a photo trap and a four-month trial period. We agreed on where I'd put the camera. So I went there and set it up." "I showed my first photos of a snow leopard to my father and he told me immediately that it was a pregnant female," Markov recalled. "A few months later, I put a camera at the same spot and caught a photo of the same female with two kittens. I got a few more photos of them and named them Batyr and Argut." Markov has been wandering the Altai Mountains since he was 5 years old, hunting with his father and herding sheep and cattle. "That was my life before I went into the army, and again after I got back," he tells RFE/RL. Under the program a village agrees to remove poaching traps and to refrain from setting more. If at the end of the year a photo trap is able to capture an image of a snow leopard in the region of that village, the WWF pays them 40,000 rubles -- the value of one pelt. In addition, the WWF hires the locals to work as guides for other projects, and rents horses from them. It was an easy transition for most to make, says Denis Malikov, scientific researcher at Sailyugemsky Park. "You shouldn't think that people here just started worrying about preserving wildlife when scientists arrived," he tells RFE/RL. "For people in Altai, both the snow leopard and the argali mountain sheep are sacred animals." Argut lies in extremely rugged terrain. Markov now has 10 cameras, and monitors three snow leopards full time. "I travel constantly, through the taiga and along the cliffs," he says. "I visit each camera once a month. I have known this whole region since I was a child. My father doesn't hunt anymore, but I'm still a hunter. Just a different kind of hunter. I try to help everyone who is trying to protect the snow leopard." "Now there are no longer markets full of snow-leopard pelts," Sailyugemsky naturalist Malikov says. "But they still often get caught in traps set for musk deer or other animals. Deer musk still brings good money." "So hunters still present a danger to the snow leopard," he adds. "One poacher might set anywhere from 50 to 200 traps." Ksenia Smolyakova is a correspondent for the Siberia Desk of RFE/RL's Russian Service.